Ben Buckley has never gotten over the loss of his wife. More bewildering than the mystery surrounding her death is the radical change that occurred in her shortly beforehand--a "conversion," she had called it. Baffled, angry, and still feeling guilty for the way he'd withdrawn from her during those final weeks, Ben now lives behind the protective walls of severed relationships and rigid routines. An unlikely young woman knocks on the door of his narrow world. Her simple honesty and childlike faith are incomprehensible to him, but in spite of his misgivings Ben finds himself on a journey he never would have begun on his own. 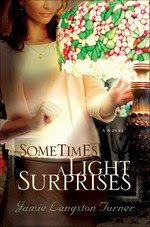 Sometimes a Light Surprises is a beautiful story of family, love, loss, grief, and spiritual growth. Told in a very unique style, this novel captivates the reader from the very start. I highley recommend it.